Pursuing Perfection, Part I defined perfectionism and helped us view it through God’s eyes. Pursuing Perfection, Part II showed how we are already perfect in God’s eyes because we receive the instantaneous perfection occurring at salvation. This third part in the series takes the idea of perfection further as we look at how perfection is a process (aka progressive sanctification). Perfectionists have one thing right, we are supposed to pursue perfection. But they go about it completely wrong by relying on their own efforts to achieve the objective. Those with a “good enough” mindset have it partially right too in that the goal is impossible. Because our efforts don’t get us to the objective, we sometimes just don’t bother to try very hard. But, the “why bother” approach does not match up with God’s desires for us either. Endurance/Patience (James 1:4) – Never giving up. Reaching the end of the race. Crossing the finish line. Love (Colossians 3:14) – Binds us together in perfect harmony. The glue for unity. Holiness (2 Corinthians 7:1) – Get rid of the bad stuff that draws us away and distracts us from God. Praise (Psalm 8:2) – Silences our enemies. Faith (1 Thessalonians 3:10) – Growing in faith takes us toward perfection. Good Works (Hebrews 13:21) – God equips and gives the desire to do them. They illustrate our faith. Unity (John 17:23) – We are more powerful as one, strong body than individual parts working separately. Strength/Power (2 Corinthians 12:9) Our imperfection (weaknesses) allows His power to show. When we try to be perfect in our own efforts, His power is no longer the focus. If we focus on these attributes, which God enables in us through His grace, we can know we are moving toward perfection. They provide a gauge by which we can assess our progress. The specifics of how these are carried out through the work we do, ministry, our hobbies & interests, etc., are unique to each individual. This eliminates the need for comparisons or competition with regard to sanctification. The struggle with perfection comes because we live in an imperfect world, we are imperfect people, and perfection really is impossible for us. But that doesn’t mean we should give up on the goal of perfection. We can’t go to the other extreme and put forth little to no effort just because we know perfection isn’t possible. A huge part of my spiritual growth has been the renewal of my mind in the area of perfectionism. But that doesn’t mean that mindset has completely disappeared. For me, it means that I choose not to let the perfectionist in me direct my life. Yes, I’ve learned not to let perfectionism rule and reign and instead to allow a perfect God to rule and reign. I’ve learned that the perfect shoes, bag & hairstyle don’t exist. I’ve learned that I don’t have to correct people’s grammar constantly. I’ve learned that most people don’t notice when commas or periods are missing. I’ve learned that my own efforts to be perfect lead to a muddy and miry pit. I’ve learned that God perfects others, not me. I’ve learned that compassion, flexibility & forgiveness require accepting imperfections. I’ve learned that walking the road to sanctification (holiness) makes my friendships, marriage and kids want to strive for perfection too. I’ve learned that imperfection allows God to be more fully present in my life as I admit my need for Him to perfect me. At the same time, I want to encourage those who are discouraged to the point of not wanting to try because they know perfection is impossible. God wants us to pursue perfection but to do so depending on Him. He wants us to play the role He has given us to play and to always strive for our best. And, He’s given us a way to accomplish perfection, both now and in the progressive sanctification that is our lives. We cannot become perfect through our own efforts. “Good enough” thinking leads to lukewarm Christians. God, in His grace, has already made us perfect through Jesus. We do have a role to play in the process of being perfected. 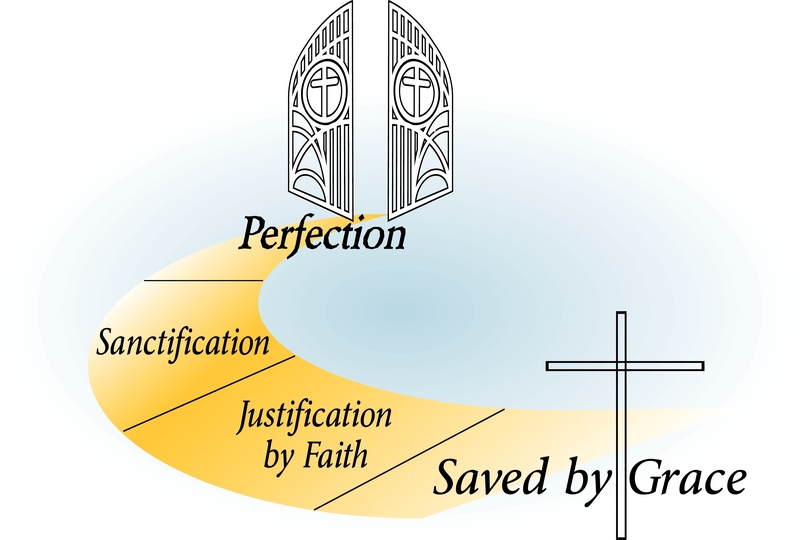 DISCUSSION: How does the process of pursuing perfection – also called progressive sanctification – exist in your life today? This entry was posted in Victory! and tagged being perfected, perfect God, perfection, perfectionism, progressive sanctification by admin. Bookmark the permalink. Wow Kari you put a lot into this post, thank you. I believe with all my heart if I pursue Him who is perfect in all ways my sanctification will progress. We cannot become perfect through our own efforts. One must take what life hands us and shift it through His hands for it to be used for His glory and our maturing. Our part is II Peter 1:5-8 where it talks about adding these things to our faith, diligence, moral excellence, knowledge, self control, perseverance, godliness, brotherly kindness and love. God has a lot to say on the topic, and I am so thankful for His Word. The scripture in 2 Peter works well for this too. Great point! When it comes to "life" i am not a perfectionist. I have the "close enough" syndrome. 🙂 When it comes to my walk with Jesus, I am trying to be His man. That means I am going to stumble, fail, fall, but get back up with His help. I am one who doesn't believe we can reach perfection here on earth. But we can strive to be more like Jesus. I like that you separated the two, life and pursuing God. In life, we certainly can't be perfectionists. While pursuing God, we are pursuing perfection since He is perfect. Knowing that God sees me as perfect through Jesus gives me confidence and motivation to pursue the perfection that will culminate when we reach Heaven. Striving to be more like Jesus is the path. Thanks Kari for this thoughtful and thought provoking series. I am sure there are times you would love to correct my grammar and commas! I know I am imperfect and sometimes knowing that and wanting to wait till all if perfect holds me back. Recently a blog writer quoted a Proverbs verse that I did not write down which tells us not to wait till all is perfect before moving ahead. So I try each day to grow in Christ and hopefully that will move me toward the day when He will make all things perfect, including me. Until then I hope I am a vessel that is willing to be molded and changed and made into what HE wants me to be. I like cycleguy often stumble and fall, but God is gracious in picking me up and helping me learn from experience and move forward. This certainly fits with your blog name, as we struggle to victory in this area. Aren't you glad scripture has so much to say on this topic? Because I struggle so much with perfectionism, I am very thankful for the guidance. Actually, I can tune out wrong grammar and spelling now when I am reading for meaning. I just turn off the editor (okay, so it's never completely off) and read for meaning. We all stumble and fall, but part of the perfecting process is struggling through to victory. So glad Jesus made that path possible! In our efforts to "be better" we should concentrate on pursuing God and in that pursuit we end up pursuing the rights things in terms of pursuing perfection. I think our ultimate goal is to pursue Him to be like Him. In becoming more like Him, we are pursuing perfection. Definitely the goal that I want to keep constantly in front of me. Well said, friend! Besides God's Word there are two major aspects of my life that constantly push me towards Jesus. The first is my wife and the second are my children. I believe our closest relationships are specifically designed by God to help us grow in the sanctification process. Terrific point! Both have played a huge role in my walk toward perfection. Completley agree! This is an area God's been working on in me for awhile. It's so ingrained in me that for every advancement I make in shaking of these chains, there's a million more to go (a millions an exaggeration, but you get my point- wink). One thing that's been so liberating to me is something you mentioned, how my weaknesses allow God to shine and work in me. I've found that my "strengths" aren't really strengths at all. They keep me from God. What I consider strengths (hard working, diligent, detail orientated, AKA perfectionism) really are idols that I put too much confidence in. And the things I considered weaknesses (time management, anxiety, people pleasing) actually brought me closer to God because I realized I needed Him to help me overcome. So I guess what I'm saying is that my "strengths" are actually my weaknesses. When I began seeing them in that light, it became easier for me to hand them over to God and allow Him to be Lord over my daily tasks and schedule. I don't want anything to get in my way of serving God. Is this comment clear as mud? Sorry for the ramble, it makes sense in my head. I think progressive sanctification exists in my life in a lot of ways. God is always working on us. I think there's the spiritual disciplines such as bible study and prayer. I think there's also God using our trials and struggles to teach us. Then there's the ability to serve him and grow that way – not to mention the growth that happens as part of a local body and in fellowship with other believers. In fact, God uses everything to conform us more and more to his image. I completely agree, Loren. I think every aspect of our lives can be used by God to perfect us. He's ready and willing. Are we?